Students at the International Monetary Fund. Image: supplied. The class spent this week in Washington DC in an exciting series of sessions reflecting on current international developments in trade and security, with the actions and approach of the Trump administration at the heart of discussions. At some of these meetings, students have been particularly interested to talk with MLS alumni and MLS PhD candidates acting as global lawyers in the US today. 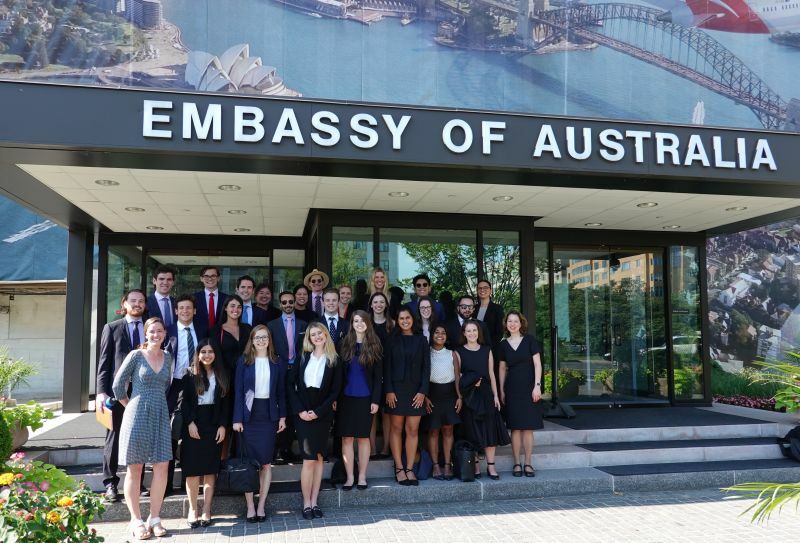 The class visited the United States Institute of Peace, the Australian Embassy, the World Bank (including the International Centre for Settlement of Investment Disputes as well as the Inspection Panel), and the International Monetary Fund, engaging in varied sessions with a range of interlocutors. The class also met with lawyers from the international arbitration groups of law firms Foley Hoag LLP and Freshfields Bruckhaus Deringer LLP, debating the merits of investor–State arbitration and learning more about international commercial arbitration. Students outside the Australian Embassy in Washington DC. Image: Supplied. At Georgetown Law, an active three-person panel including different institutional perspectives joined the class in examining the consistency of recent US trade actions with US and international law. At George Washington University, the class met with representatives of the Responsible Business Alliance, the SMU Dedman School of Law, IDB Invest, the International Committee of the Red Cross, the Fund for Peace, and the Center for Civilians in Conflict. The week ended with a full day of intense deliberations at the Pentagon. The class continues in New York city this week.